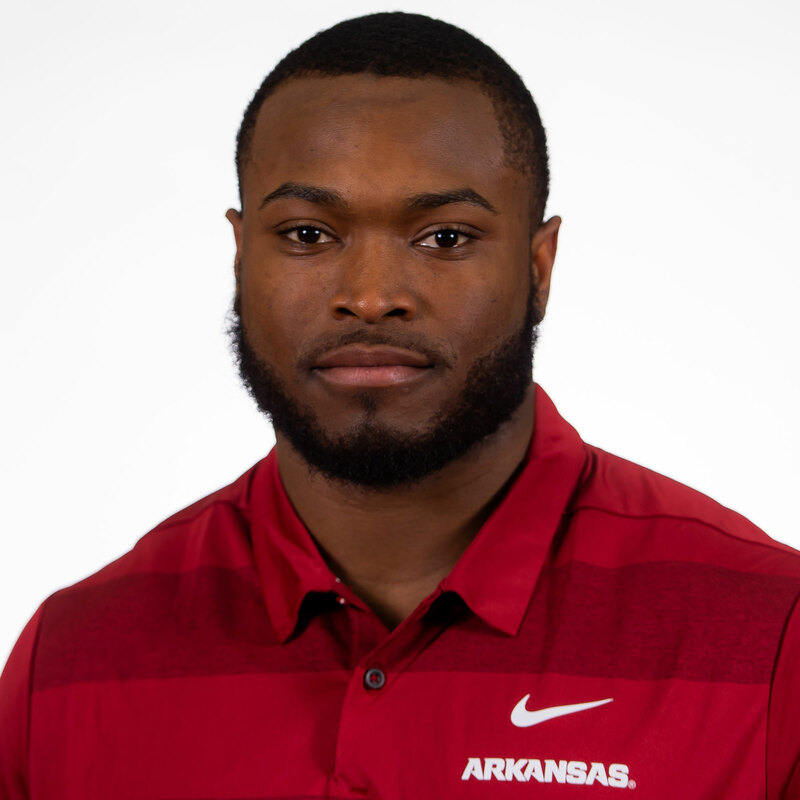 2018 (JUNIOR): Started all 12 games for the Razorbacks at the middle inside linebacker spot in 2018 … Totaled 890 snaps over the course of his junior campaign, according to Pro Football Focus, with 763 coming on defense, while also seeing time on Arkansas’ punt coverage & return units … Earned All-SEC Second Team honors from the Associated Press … Led the SEC in total tackles and solo tackles, posting 118 and 62, respectively … Back-to-back years leading the team in total stops … Seventh Razorback and first since 2010-2011 (Jerry Franklin) to hit 100 tackles in consecutive seasons … Needed 15 more total tackles to crack the top 10 in a single season by an Arkansas defender … Posted seven double-digit tackle performances, including five in conference play, which featured a three-game stretch of 11 or more against Texas A&M (Sept. 29), Alabama (Oct. 6) and Ole Miss (Oct. 13) … Also recorded nine tackles for loss for 23 yards, including two sacks, five pass breakups, two quarterback hurries, forced a fumble and recovered another … Opened the season with nine tackles against Eastern Illinois, while also forcing a fumble that was recovered by Santos Ramirez and eventually turned into a touchdown … Notched his first double-digit tackle game of the year the following week at Colorado State, securing 11 stops against the Rams … Had one TFL in the contest … Upped his season-best to 12 tackles in week three vs. North Texas, including seven solo stops … After five tackles at Auburn to begin SEC action, returned to post a team-best 16 tackles, 12 solo, against Texas A&M in Arlington on Sept. 29 … Also had two tackles for loss vs. the Aggies, including his first sack of the season … Rattled off 11 tackles against Alabama and 13 vs. Ole Miss in Little Rock, producing his second sack of the year against the Rebels … Racked up 11 and 12 tackles in the final two home games of the year vs. Vanderbilt and LSU, respectively, adding three more TFLs between the two contests, with two coming against the Tigers in the home finale (Nov. 10) … Ended the year with five tackles at Mississippi State and eight at Missouri, recovering a fumble vs. the Tigers in the third quarter … Put together an overall tackling grade of 83.0 during the season from PFF, with four games over 81.0 … Hit his best against Ole Miss with a mark of 87.1 … Opened the year with an 83.0 tackling grade against Eastern Illinois, while also hitting a run defense mark of 85.5 that would stand as his top grade of the year in the category … His 126 special teams snaps in 2018 were his most of his three years, increasing his career total to 293 … Was part of a trio of Razorbacks (Dre Greenlaw & Santos Ramirez) that led the conference the majority of the season in total tackles, topping off at 285 last year … Member of a defensive crew that racked up 882 total tackles over the course of the 2018 campaign, giving him 13.3 percent of the team’s stops last year … Entered the year with three preseason All-SEC accolades, a second team honor from Phil Steele and third team accolades from the SEC coaches & media) … Also landed on the preseason Bednarik, Bronko Nagurski and Butkus Award watch lists. 2017 (SOPHOMORE): Led the team in total tackles (115), tackles for loss (8.5) and sacks (3.5) … First Razorback to lead a team in tackles, tackles for loss and sacks in the same season since at least 1973 … Second in the SEC in tackles (155), tackles per game (9.5), tackles per SEC game (10.6), double-digit tackle games (7) … Played 93 percent of the team’s defensive snaps … Led the team and ranked third in the SEC in solo tackles (66)… 66 solo stops were the most by a Razorback in a single season since Sam Olajubutu tallied 67 in 2005 … One of 20 players in the FBS, including three in the SEC, with 115+ tackles and 8.5+ tackles for loss … Of his seven 10-plus tackle performances, six came against SEC opponents, which tied for the league lead … Collected 10+ tackles in each of his first four SEC games … Joined Dre Greenlaw as the only SEC teammates to each record 100+ tackles on the season … First Razorback linebacker to earn All-SEC status since Martrell Spaight earned AP and Coaches first-team honors following the 2014 season … 115 tackles was the most by an Arkansas player since Martrell Spaight tallied 123 in 12 regular-season games in 2014 and finished with an SEC-best 128 … vs. Florida A&M (Aug. 31): Led the team in tackles (5) for the third time in his career and recorded a tackle for loss … vs. Texas A&M (Sept. 23): Tied Dre Greenlaw for the team lead in tackles with 14 tackles, including six solo stops … Had 1.5 tackles for loss in the first half … at South Carolina (Oct. 7): Finished with 12 tackles, including eight (seven solo) in the first half … at No. 1 Alabama (Oct. 14): Finished with a team-high 12 tackles to lead the team for the fourth time and sixth time in his career … Career-high 2.0 tackles, including 1.0 sack, resulted in lost yardage … In the first half tallied nine tackles, including six solo, to go along with 1.0 sack and 2.0 tackles for loss … vs. No. 21 Auburn (Oct. 21): Recorded 11 tackles to give him his fourth double-digit tackle performance over the previous five games, including three straight … vs. Coastal Carolina (Nov. 4): Finished with a game-high 13 tackles, 11 solo stops, 1.0 sack, 2.0 tackles for loss and one quarterback hurry … Recorded 10+ tackles for the fifth time of the season and in his career … Picked up 2.0 tackles for loss equaled his career-high and was his third multi-tackle for loss game of the year … at No. 24 LSU (Nov. 11): Recorded a team-high 12 tackles, his sixth double-digit tackle game of the year and fifth in SEC action … vs. No. 16 Mississippi State (Nov. 18): Recorded eight tackles to bring his eclipse 100 on the year … Became the first Razorback since Brooks Ellis in 2015 to record 100 tackles in a season … vs. Missouri (Nov. 24): Stuffed the stat sheet with a career-high 14 tackles (6 solo), 1.0 sack, 1.0 for loss and three quarterback hurries. 2016 (FRESHMAN): Provided depth at linebacker and played a key role on special teams … Saw action in 12 games … Totaled 37 tackles with 2.0 tackles for loss (-8) and 1.0 sack (-6) … Added a forced fumble … Ranked second on the team with 11 special teams tackles … His 37 total tackles ranked eighth among SEC freshmen … 25 tackles came in SEC games … Collected seven or more stops in three games … vs. Texas State (Sept. 17): Made his first two tackles of the season on defense … vs. Alcorn State (Oct. 1): Turned in a solid effort with a team-high tying seven tackles, including three solo and 0.5 for loss … Five tackles came in the first half … vs. No. 1 Alabama (Oct. 8): Forced a fumble recovered by Ryan Pulley at the Arkansas 3-yard line on Alabama’s first possession of the second half … vs. No. 24 LSU (Nov. 12): Contributed seven tackles, all in the second half, including 1.5 for loss and one sack … Registered a sack for a loss of six yards on third down inside the five-minute mark … Made three straight stops inside Arkansas’ 4-yard line to force a field goal attempt in the fourth quarter … at Mississippi State (Nov. 19): Followed up with a season-high 10 tackles (four solo) in the road win. HIGH SCHOOL: A consensus three-star recruit by ESPN, 247Sports, Rivals and Scout … Ranked as a top 30 inside linebacker nationally by ESPN and 247Sports … Rated the No. 38 overall prospect in the state of Louisiana by 247Sports … Has a verified 40 time of 4.82 according to Scout … Led John Ehret High School to the state championship game and a 12-3 record in 2015 under head coach Corey Lambert and position coach Bryan Crayton … Was named the Offensive Player of the Year on The New Orleans Advocate All-Metro Team for large schools … Named All-District 8-5A following the 2015 season … Recorded 83 tackles, including 14 for loss to lead the defense as a senior … The versatile athlete also rushed for 1,058 yards, had 374 receiving yards and threw for another 495 yards … He also saw time as the kicker and punter … Also played basketball and track … Chose Arkansas over Oregon, Arizona State, Colorado, Memphis, Western Kentucky, Arkansas State, Louisiana Tech, Southern Miss and others. PERSONAL: Born on Nov. 1, 1997 … Son of Lee and Trenise Murphy … Full name is De’Jon Raiheem Harris … Nickname “Scoota” was given to him by his mother when he was a baby … Communication major.